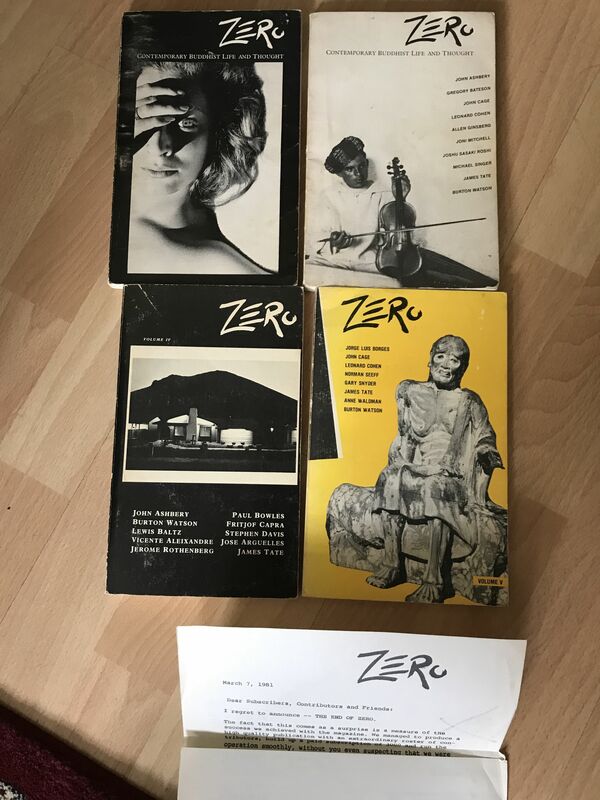 I have four out of the five editions of Zero: Contemporary Buddhist Life and Thought for sale. The quarterly journal was co-edited by Leonard and other members of Sasaki Roshi's community. It features some of Leonard's poetry as well as poems and articles from the likes of Paul Bowles, Frijthof Capra, John Cage, Gregory Bateson, Gary Snyder, Anne Waldman, Joni Mitchell and, of course, Sasaki Roshi. Volume V also contains an insert from the producers saying this will be the final edition. They're not in mint condition having been on shelves in my different houses since 1979, so there are a few scuffs and indentations. I can provide more detailed photos if anyone wants them.